The Glenn Beck Review: Glenn Beck: Thinker, Pundit or Charlatan? Glenn Beck is always telling his viewers that progressives are undermining the Constitution. On his Fox show of 5/4/10 Beck drew a model of the Constitution as a table with three legs. The top portion was the Constitution itself. The three legs, according to Beck are faith, hope and charity, his major themes as of late. That's interesting because The Review was taught in high school that the job of upholding the Constitution was given to the Supreme Court. What else holds up the Constitution? In graduate school, it was taught that public consent to being ruled, to the laws and the system of government is why we don't have a revolution that would toss out the Constitution. Finally, a third leg would have to be the military force of national security. Without that, we might be speaking German or another language; and we certainly wouldn't be living under our founding document. On his Founders Friday show of 6/18/10, Beck and his guest were discussing Thomas Jefferson's famous line, "Question with boldness." The line is from a letter to his nephew, and the whole quote is "Question with boldness even the existence of God. If there is a God, He will respond to reason." At this point Beck chimed in "It is surely honest questioning over blind folded fear." This is an interesting line coming from the man that the Anti-Defamation League deemed the "fear-monger-in-chief" and Media Matters, a progressive watch dog organization based in Washington, DC, dubbed Beck the "misinformer-in-chief." For The Review, a more fascinating point than Beck's assertion of honesty is the idea of asking honest questions. What is an honest question? There are dumb questions, and there are brilliant questions. There is a wide range of questions in between those extremes. There are dishonest answers, inaccurate answers including lies; and there are right answers. There is no such thing as a dishonest question; that's an unintelligible statement. These are only two examples that demonstrate one of the three basic assertions from The Glenn Beck Review: Beck is a proven liar, a proven hypocrite and a charlatan. This will be made clear as lost posts from another blog are reconstructed here. What is puzzling to The Review is why anyone ignores being lied to. Why does anyone listen to a hypocrite? Why don't others understand basic concepts reviewed in this post? One answer has to do with Beck's method of communication. Yes, he's passionate; and there's nothing wrong with that even if it's now known that he fakes his tears. No, he has millions following him because of his gift: Glenn Beck is an amazing salesman. He could sell spit to a llama. 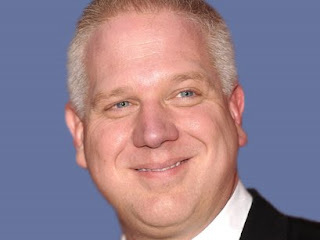 Glenn Beck is living proof that you can indeed fool some of the people all of the time. Update, 1/12/11: It turns out that the line about "honest questioning" is a misquotation from Jefferson. This is spelled out in the coverage of Beck's 8/28 speech on the Washington Mall where he used the misquote again, that time very hypocritically. Make a comment. Tell The Review what you think about Beck's reasoning. Beck is often telling his viewers to get others to watch his show. The Glenn Beck Review is using the same, counter strategy. Share this URL: pass this blog URL along to others who are or might be supporters of Beck. The Glenn Beck Review is more for his supporters than for his detractors who already know that Glenn Beck isn't worthy of respect. The Review was taught in high school that the job of upholding the Constitution was given to the Supreme Court. What else holds up the Constitution? In graduate school, it was taught that public consent to being ruled, to the laws and the system of government is why we don't have a revolution that would toss out the Constitution. The Constitution should not only be upheld by the SCOTUS, but every federal representative is bound by an oath to do the same. It’s why we are not a Democracy but a Republic. Our representatives are supposed to do just that. Currently they are not. You ask what is the definition of an “honest question”? You like to paint over the language with platitudes and partial opinions but the quote that Beck used was originally used in its entirety. I guess you were to busy reading Media Matters that day. Regular viewers already got the context and he (Jefferson) is correct. Question everything. Don’t believe some guy on the television or the radio just because you like them. How many times does Beck have to say, “If you believe what I say at face value, you are an idiot and part of the problem?” Question with boldness indeed. Beck points out avenues of research to me. I watch his show because of his passion and his ability to deliver the message. I have since he was on CNN also. Can we get a scathing article about CNN based on that? His message hasn’t changed at all. He was not fired from CNN. His ratings were phenomenal for that network. He had a disagreement with the network about a particular story and that ended that affiliation. You can post garbage for days here and only your left-wing buddies will buy it. They rarely watch the show just like you. You offer few examples of his misleading tirades aside from the few episodes you have watched. I could easily do the same with Maddow or Mathews on what they state but they are not worth my time. They are shills for an agenda that their network follows. No better or worse than Beck aside from the fact that he provides evidence or points of origin for people to do their own research. Brad, we can debate what else upholds the Constitution besides the SCOTUS, public consent and the structures and functions of national security. It's certainly possible that a better model is has four legs. What's not debatable is that Glenn Beck is off the wall and completely ignorant, based on his ideas, of what holds up the Constitution. He is an ignorant fake with millions of supporter who apparently are as ignorant as he is or indifferent about being lead by a corporate shill who is out for number 1. I don't need to read Media Matters or anyone else to know that the idea of an honest question is unintelligible. Period. Yep, Beck is passionate and extremely gifted at fooling people like yourself. His ratings only mean that people don't care about the facts; they want to have their reactionary beliefs re-enforced. Beck is extraordinary at doing just that. We're going to have a scathing article on CNN soon. I'm reading Common Nonsense, and I just happen to be on the chapter, "This is CNN?" CNN is where I first encountered Beck since I do not listen to talk radio. So far as only my "left wing buddies" appreciating what I'm doing, you're wrong. Lisa Houserman is a Libertanian, and she's not the first Libertanian to have issues with Beck. There are also conservatives who have issues with Beck and his ilk. For you to assert that I don't watch Beck often is for you to make an ignorant assertion...just like Beck often does. You learn well grass hopper. Dude you got crappy schooling. All our Washington goof balls sware an oath to protect and defend the constitution. SC inturprets to keep the other screw balls in check and they haven't done that very well. If you went to a good school you would have learned about checks and balences. Maybe you dosed off that day. Good job bringing up Media matters. They had to admit they made a mistake when they ran a dishonest clip of the Beck show. A mistake that was done on purpose and should have made national attention. Big Rich, you are only pointing out that my model is incomplete, and I accept that. So make the Constitution supported by four legs. That improvement does nothing but further mock the stupid notion that the Constitution is held up by faith, hope and charity. Thanks for improving my model. Now when will you criticize Beck for being an utter fraud? BTW, I called out Media Matters this week because their press release actually indicated something that Beck did not say. I notified them of this, and they corrected the transcript on their website. To error is human, but you're right. They should have been called out louder for Breitbarting Beck just as Beck should have been called out by anyone beside News Hounds and I when he Breitbarted Obama.